Our next stop was Grand Rapids MI. I had a strong desire to enter the ministry as a vocation. Kathee and I prayed about this for almost a year. We considered both Grace Theological Seminary (Winona Lake, IN) and Grand Rapids Baptist. We visited both schools and thought Grand Rapids would be best for us. 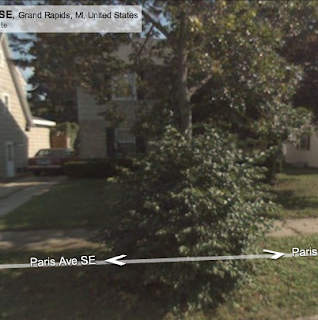 We bought a house on Paris Avenue. Because housing was much less expensive in Michigan than Pittsburgh we were able to buy a very nice house for much less than the house we sold in Pittsburgh. We moved Grand Rapids in August 1978. Kathee was rehired by IBM as an engineer. She had been working for Mellon Bank while in Pittsburgh. This house (it's a little hard to see) was built in 1934 by a prominent physician. It had 4 bedrooms upstairs and a living room, dining room, and a family room on the main level. Additionally it had a full apartment in the basement. I rented this out to seminarians for the two years we lived here. We would move back to this neighborhood! I served as a deacon and youth director at Good News Baptist while we lived here. Update on "The Now Famous Chart"
Another test of religious liberty? Climate Change: The collapse of the "consensus""
Chrysler bankruptcy: Attorney rip off! Here comes "Cap and Trade"
Update: $ 134 Billion in bonds fake! Taxing company cell phones as a "fringe benefit"
Thanks to Obama: "they love us again!" "I don't know anything about cars"
Global Warming: "Where's the beef?" A "ding-bat doormat" who married a "Crockefeller"